If you google victimhood status or victimhood chic, you will be surprised at how many hits you get; and how far back it goes. This is not a new cultural condition, yet it’s popularity and acceptance does seem to be on the rise. It has become a good thing to be considered a victim. The draw of victimhood is beyond my understanding. I see nothing positive or attractive about being a victim. Being a victim means that you have been harmed or injured in some way as a result of a crime, accident or other event or action, or that you have been tricked or duped. Is there good in any of that? No. This blog post is not intended to diminish people who have succumbed to their injuries. It is not to say there have been no victims of cancer, automobile accidents, domestic abuse, racial injustice, or any number of horrific events; there have been, and there will continue to be. We all know people who have suffered legitimate and egregious wounds; people who were genuinely scarred from horribly unjust injuries – whether physical, spiritual, or emotional. Most of us have been a victim at one time or another. Even I have been a victim of atrocities that I wouldn’t wish on anyone. However, I do believe there is a distinct difference between being a victim, and living in victimhood. It seems that our culture is glorifying victimhood: the state of remaining a victim. It is now favorable to live in victimhood rather than overcome whatever it is, or was, that victimized you. I’m not a theologian or a sociologist, I don’t understand this thinking, and therefore, I ask: why? Why would anyone want to live in perpetual victimhood? The opposite of being a victim might be a survivor. If that is true, then the opposite of victimhood requires the recognition that bad things happen to everyone, and because bad things happen, survivors choose not to be defined by those bad things; rather, they choose to rise above or overcome. We all know people who have been hurt tremendously – who were victims – but who have chosen not to remain in victimhood. People who bravely and courageously overcame emotional, physical, and or spiritual setbacks – people who chose to thrive in whatever circumstances they found themselves. These people chose to survive. Survival doesn’t mean that you act as if nothing happened – but it does mean that you don’t let whatever catastrophe that victimized you define the parameters of who you are. You are not your pain. Overcoming means that you grow beyond the trauma. This is not automatic; there comes a time in every victim’s life where one must choose whether they want to remain a victim – whether they want to live in victimhood — or move beyond it. Things happen to us in life – sometimes awful, life-changing things. Many things outside of our control have the potential to overwhelm and scar us physically, emotionally, and/or spiritually. Evils may be perpetrated against us that cause us to question the degree to which one human being can hurt another. This world is full of evil people and evil things. However, is victimhood biblical? As Christians, we are in the grip of Christ and there is nothing that happens to us that does not filter through the hands of our loving God. He allows hard things in our lives, as he allowed hard things in Job’s (remember Job, he lost his family, his health, and his fortune in one day. I wrote about that here). And God also ordains hard things for his own purposes. Hard things happen – people are victimized — and in every hard thing, there is the intention of the evil one for evil, and the intention of God for good. The story of Joseph reminds us of that: when his brothers threw him in a cistern, then sold him as a slave, Joseph’s brothers were fully responsible for the wickedness perpetrated against Joseph. However, it was in those same events that God was at work for good. As Christians, we must believe as Joseph did, that things that are intended to harm us, are also being used by God for our good, Paul tells us this in Romans. Therefore, the things that victimize us are the very things God is using for our good. And what is that good: To be conformed to the image of Christ Jesus. God knows the best tool for removing or refining the traits and attitudes that prevent or promote our conforming to the image of Jesus. Sometimes God will use a powder puff or a polishing cloth, but sometimes God uses a hammer and chisel! This knowledge is the key to exiting victimhood status. This is the means of overcoming. We escape the victim mentality when we believe that God is at work in our lives and is using every detail of every event for our eternal good. If we do not believe God is at work in every moment of our lives – even the things that have hurt, deceived, exploited, or persecuted us – then we cannot leave victimhood behind. We become victims of our circumstances when we refuse to see God in them. Your circumstances may not change when you trust Jesus with the details of your life, but your status will. When you accept Jesus as the Lord over your life, he will also be the Lord over all the things that have victimized you and he will use them for your good. And you will be able to use them for his glory as you help others in similar situations. Are you a victim? Are you defined by your victim status? 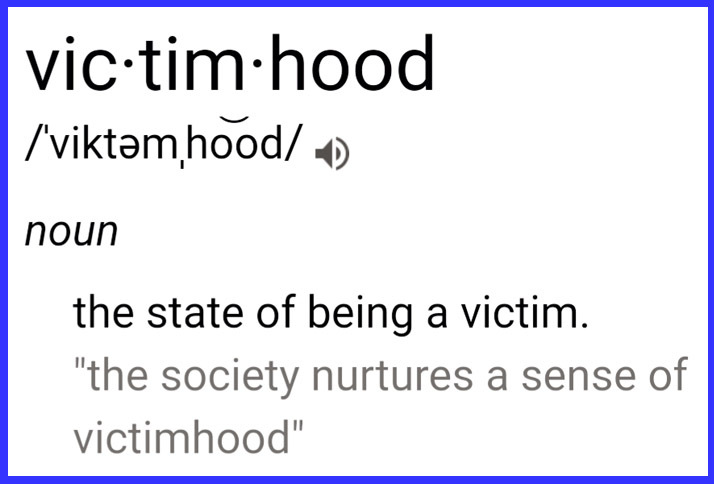 Are you living in victimhood? How does that align with the freedom that is yours in Christ Jesus? Will you choose today to flee the boundaries of your hurts and live in the freedom of Christ Jesus? I thoroughly enjoyed your article. I had a friend who was in a severe state of vicitimhood, that I just didn’t want to visit or see her. It’s a sad state.